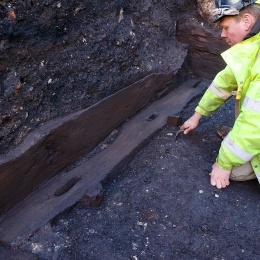 CITE AS: Chiz Harward, "A 17th Century Timber Structure," in 100 Minories, March 31, 2015, https://100minories.lparchaeology.com/a-17th-century-timber-structure/ [Date Accessed: April 23, 2019]. Overhead photograph of timber structure. Archaeologist John Quarrell carrying out timber recording. At 100 Minories the sheer depth and relatively recent date of the archaeological deposits has meant that some organic remains have survived on the site despite the upper levels not being waterlogged or fully anaerobic. Typically these are leather offcuts and parts of shoes, but we also recover fragments of cloth and wood. 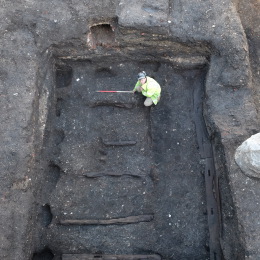 We recently excavated a large rectangular pit dating from the early-mid 17th century containing over forty oak and pine timbers. The pit originally measured 4.5m by 6m east-west, and was 1.2m deep. 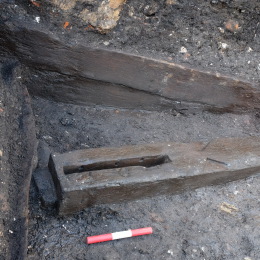 The sides of the pit had been lined with oak planks, which would have been held in place by upright timber studs set into oak baseplates, themselves supported on oak timber chocks and staked in place. At some point the pit and its timber lining was extended to the south by 1.4m and a series of joists were lain on the pit floor. These probably carried a floor of pine planks, although none were found in situ. At least two of the oak timbers had been reused: one baseplate had empty mortices from its original use on its underside, with new mortices cut into the upper side to take vertical studs that would retain the plank lining; whilst another timber had a long mortice with several peg holes from timber-framing. These pieces were definitely re-used and may have been of some age by the time they were converted for their secondary use. Most of the timbers however were sawn offcuts from the conversion of tree trunks to planks or squared beams: typically one side would be sawn flat, the other side retained the rounded shape of the natural edge of the tree trunk. Several timbers contained large knots and were of poor quality whilst a sawn wooden post-pad set in the centre of the pit is probably from the fork between two boughs on a tree. 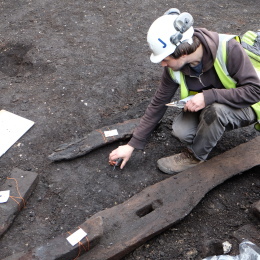 The timber appears to be mostly poor quality offcuts and wood that would have been available at little cost and may suggest the site was close to a timber yard or store. 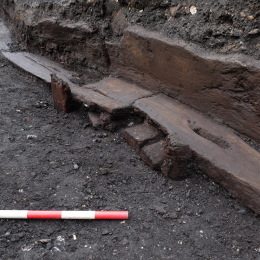 Much of the timber lining had been robbed out when the pit went out of use, but several pine planks and a single oak upright had been left in the base of the pit, embedded within a deposit of compressed sawdust and wood chippings. This infilling also suggests an association with, or proximity to wood working, although the material may have just been dumped within a convenient empty pit. There is no single obvious function for the structure: there is no evidence for any above-ground structure or building, or even paths or surfaces around the structure, so it is unlikely to be a cellar or basement; the timber lining is unlikely to have been water-tight and there was certainly no effort to line it with clay so it is unlikely to have held water or another liquid. Many timber tanks and structures have been found in London and are often interpreted as tanks or tanning pits, however this is unlikely for this example. The presence of sawdust and wood chippings, as well as the poor quality of the timbers might suggest it was within a timber yard, but the function is unclear: for example it is too shallow and wide for a sawpit. Future work will concentrate on the recording and interpretation of the timbers, establishing their original use and function, and searching for parallels and possible functions for the structure.